I have also included a link to a Jamie Oliver roasted vegetable recipe which I saw him make on TV recently and looked fantastic! He's used all kinds of often forgotten root vegetables, and seasoned each differently. It's on the menu for my Christmas dinner this year, so perhaps you may also wish to try it out too! 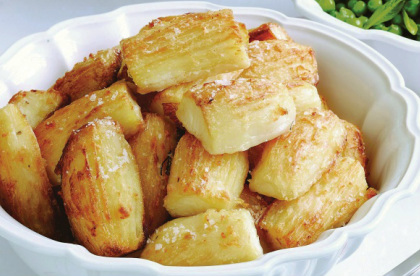 All you need to make these delicious roast potatoes is at least 2-3 potatoes per person, a handful of flour, 50g of butter and olive oil. Firstly boil the peeled potatoes for roughly 5-10 minutes, or until slightly tender. Let them cool for 15minutes. Preheat the oven to 180C. When you can comfortably handle the potaties, use a fork to scrape ridges all around the potatoes. Then cover the potatoes in flour. Get a large oven tray and fill it to roughly 2cm deep with olive oil. Lay out the potatoes in a single layer on the tray, turning them over to coat them with oil. Melt the butter in the microwave or on the stove and brush the butter onto the potatoes, coating them entirely. Keep remaining butter aside. Place the potatoes in the oven, setting the timer for 50minutes. Halfway through, take them out and rebrush them with buter. Any left over can be put in with the potatoes. Put the potatoes back in the oven. When cooked, they can be put out on kitchen paper to remove grease if desired. They should be nice and crispy. Enjoy! Mum's roast pumpkin is a favourite for the whole family! And the best bit is, its easy! You will need pumpkin, olive oil, 4-6 garlic cloves, cinnamon and brown sugar. Pre-heat the oven to 180C. Take enough pumpkin to give everyone at least a few decent sized pieces, as they will come back for more! ;-) Cut the pumpkin in half and de-seed it. Then peel the pumpkin - this is the hardest bit. Feel free to chop it into eighths to get at the angles more easily. Cut the peeled pumpkin into pieces roughly 2-3cm thick. You can choose whether you prefer longer or shorter pieces. Get a large oven dish and coat it with olive oil - a few tablespoons worth. Place the pumpkin in the oven dish and turn over to coat with oil. Add 4-6 garlic gloves, still with the skin on, and sprinkle the whole mix with cinnamon. When the oven is warm, place the pumpkin in the oven, and set the timer for 45 minutes initially. Keep an eye on the pumpkin, and take it out to turn it over after roughly 20-25 minutes. When it is getting brown and is getting tender (this may take longer than 45 minutes, or even be a little shorter, depending on the size of the pumpkin pieces), sprinkle the pumpkin lightly with brown sugar. When the brown sugar has caramelised and the pumpkin is tender enough to fall apart a bit, it is ready to serve. For garlic lovers, the roasted garlic is delicious. If there are none of those around, just serve the pumpkin without the garlic. Enjoy! There is an english version and a dutch version of this recipe. They vary slightly, and I actually think the dutch one is a little more interesting, so you might want to use google translate on this one. Looks delicious, give 'em a try!